And all Material - Wool, Silk, Cotton, Linen, Viscose, Sisal, Karastan, Tapastry, synthetic rugs & more. 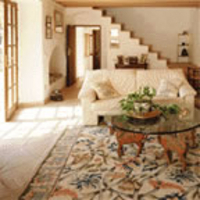 Rugs are very different to carpets; they are often made with wool, silk etc. This can sometimes lead to colour run problems, for these reasonswe always test them thoroughly first. At Clean It we pride ourselves with a long and respected tradition in the field of rug cleaning & repair and our experts are knowledgeable in the ways of area rug cleaning. Our expertly trained technicians begin the cleaning process by identifying fibers and dyestuff so that they are sure that the cleaning method applied is the very best for your product. All Rug Types All Origins. Whether you have a fine handwoven, antique Persian or a funky bright, contemporary shag, you want your work of art to be cleaned or repaired thoughtfully and carefully. Natural fibers such as wool and cotton require different care from nylon or polyblends. These are produced by insects or animals and include wool, silk and hair. Our experts will determine the appropriate cleaning process for your rug based on its individual characteristics, such as its origin, type, material & dyes. Normal spot and stain removal is included in our cleaning price and our steam cleaning process.